Located just outside the Flinders Ranges, about 33km north of Quorn, the car park for the Kanyaka waterhole is the starting point for a short 2 km walk that will take you from the ancient waterhole used by the Indigenous people for thousands of years prior to European settlement to the ruins of a pioneering station, which was once one of the largest stations in the area. 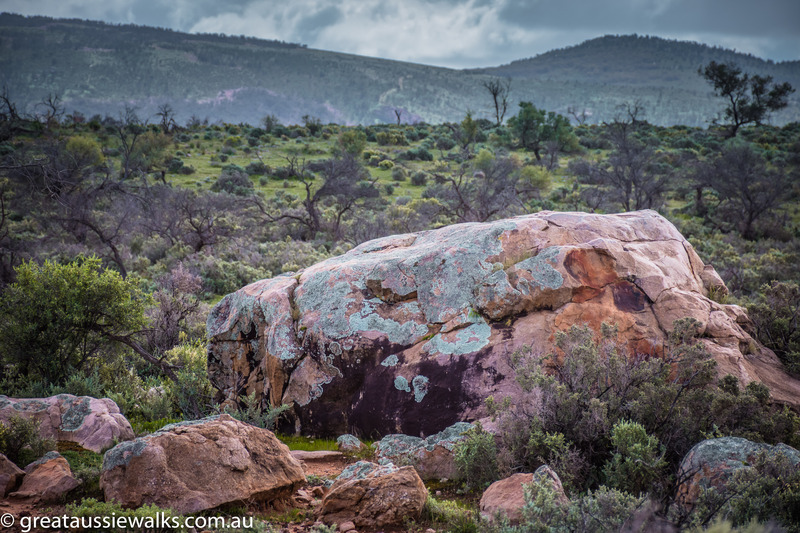 The large rock formations, easily seen from the Hawker-Quorn road, also known as Flinders Ranges Way, mark the turn off to the car park and the start of this walking trail. 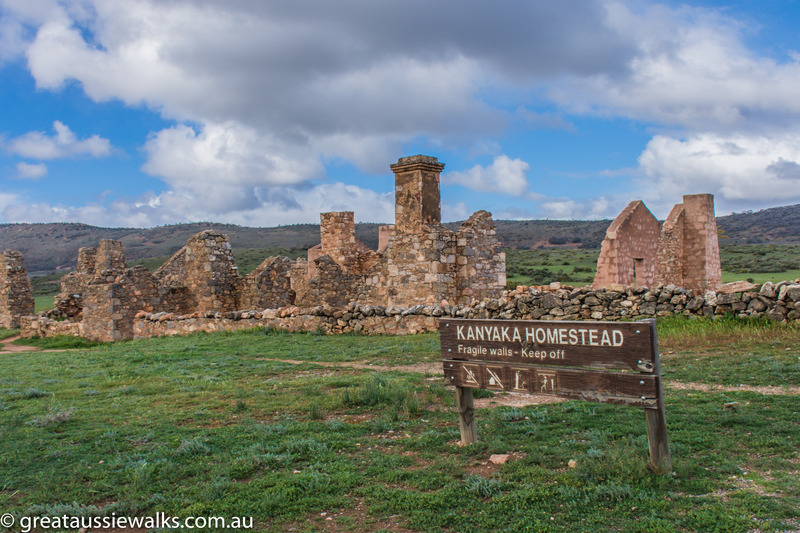 Kanyaka, meaning piece of rock, is the site of a permanent spring fed waterhole that was a source of water and a camping site for the Aboriginal people prior to the settlement of Europeans in the 1800s. 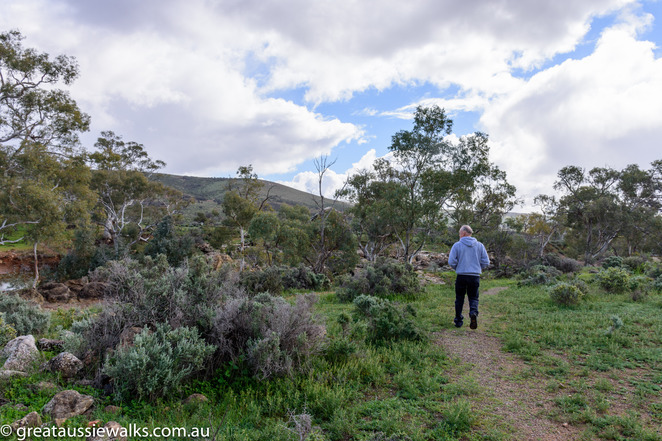 More recently, the original narrow gauge Great Northern Railway track used by the Ghan, ran parrallel to the road, remnants of which can be seen near the start of the unsealed walking trail. The waterhole is a scenic and peaceful place, surrounded by river red gums Towering over the 7 metre high quartzite rock formation known as Death Rock, which overlooks the bank of Kanyaka Creek. 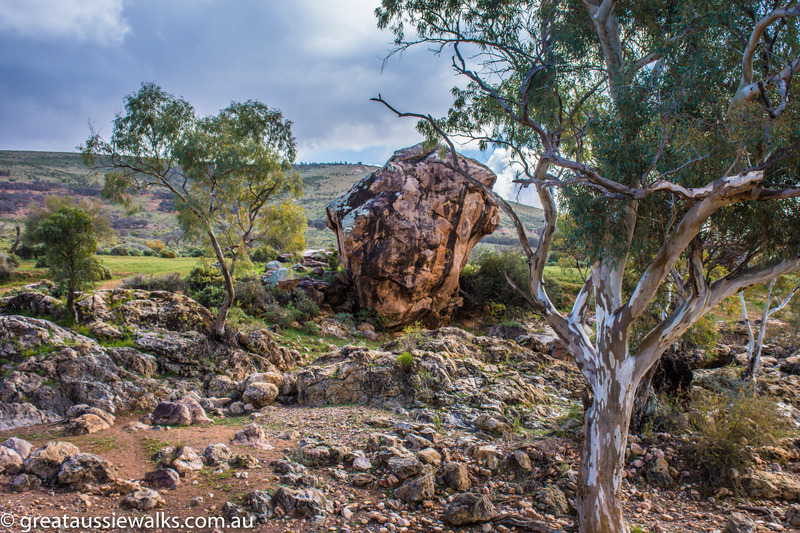 The enormous rock is linked to an Aboriginal legend in which people nearing death were brought to the rock and laid down under its shadow to die. The short walk from the waterhole along the dirt and gravel trail leads to the site of the Yankaka Station ruins, originally purchased by Hugh Proby, the son of an English Earl. Arriving in Australia with his childhood friend on the Wellington in 1851, Proby paid 10 shillings per square mile for a lease on the land and by 1852, he had established a 1200 head cattle station. As the station expanded, Proby began employing men and commenced building huts to accommodate them. Life on the station was hard work and although Proby had started with enough financial resources, the anticipated profit from the sale of his fattened cattle was crucial to his continued success. Before this could be realised, tragedy struck following a thunderstorm, which caused his cattle to stampede. When 24-year-old Proby and his stockman rode out to control the cattle, they were confronted by the rampaging torrent of the Willochra Creek. Proby was swept from his horse and drowned. He was buried nearby, although his grave is not located on the property as the Kanyaka cemetery was established well after his death. The stone ruins you see on the property today are the work of the John Randall Phillips who managed the station after he purchased the land in partnership with by Alexander Grant. 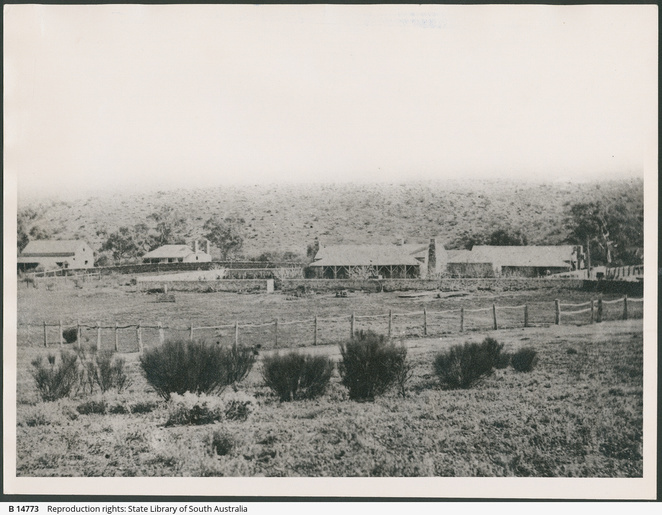 Changing from a cattle station to a sheep station, it became one of the largest stations in the area with up to seventy families living and working on the property. Self-sufficiency was important to station life, transportation of supplies to the homestead and cottages would have been difficult in the days of early settlement. In addition to housing, the station buildings grew to include workshops, stables, shearing sheds, huts and carpenter and blacksmith sheds, mostly constructed from local stone, some with walls 0.5 metres thick. Almost 40 kilometres of dry-stone wall fencing was built on the station, the remains of which are still standing on the ruins site today. Cows, sheep and pigs were raised and vegetable gardens were established to supply food for the station residents. Supplies of staple items such as tea, sugar, flour and clothes were purchased in bulk and transported to the station, although delivery times were extremely slow and at times, unreliable. The largest ruin on site is the 16 room homestead, which was the nucleus of the station. With five bedrooms, a surgery, kitchen, dining room, cellars, pantry and parlour, it was considered quite grand. During the time of the station operation, the homestead was also used as a Post Office. 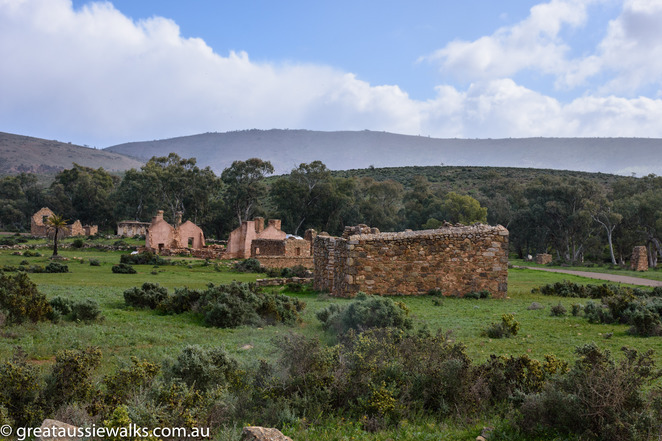 On the hill to the east of the homestead, the cart shed, carpenter and blacksmith shed ruins are all that is left of the area which once housed a cow shed, pig sties, chicken shed and stock yard. 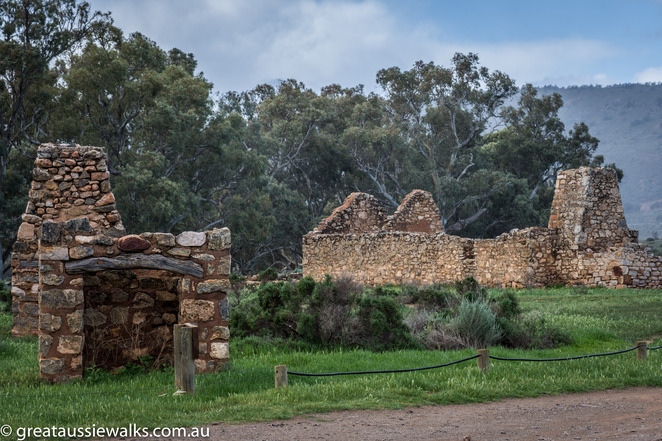 Near the homestead, the remains of the Overseers House where William James and his wife Annie lived and raised their son William, stands in reasonably good repair, with most of the walls and chimneys still standing. The five roomed building later became used for single male workers and became known as Bachelors Hall. 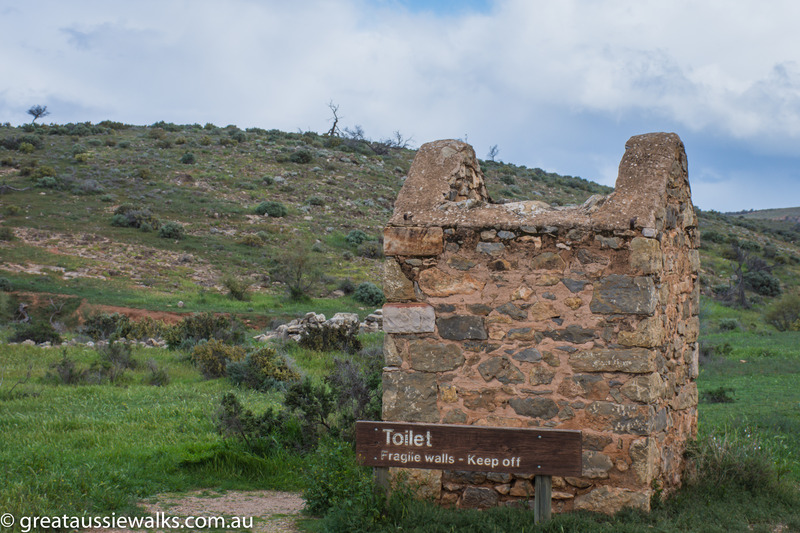 If you walk 50 metres to the north, you'll see the remains of the Mens' kitchen and workers huts. Located across the creek are eight marked graves, accompanied by several other unmarked graves in the cemetery, the final resting place for several of the residents including Martha Phillips, wife of station owner John Phillips. If you walk about a kilometre along the creek, you'll find the remains of the woolshed and adjacent shearers quarters. During the station's life, this building would have been a hive of activity with the woolshed able to accommodate 12 shearers on each side of the building. 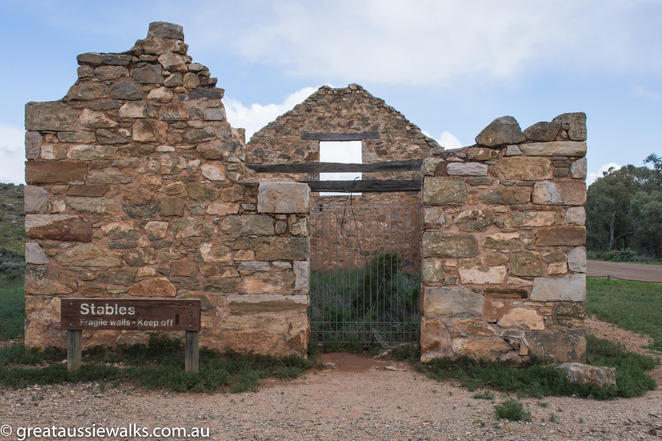 In 1864, the wool from 41,000 sheep shorn in Kanyaka was transported to Port Augusta. This was to be the most productive year for the station, supplying work for musterers, shearers, wool classers, packers and teamsters, but sadly the following years were drastically impacted by a drought which lasted until 1867. 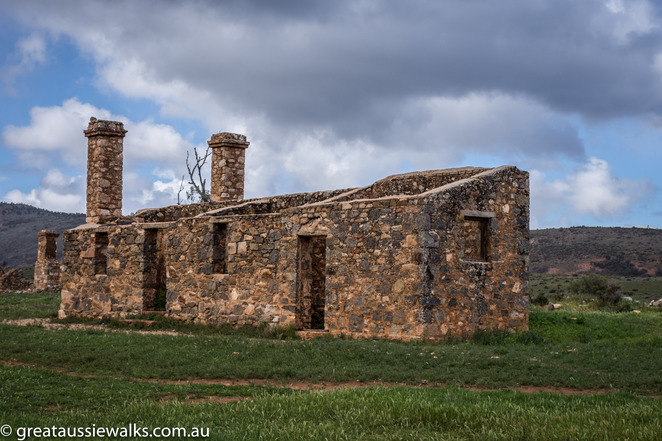 Over 20,000 sheep starved to death as a result of the drought, the station gradually fell into decline with workers being laid off, until the station was abandoned in 1888. Due to the stone construction of the buildings, many of the buildings are in a good state and provide an insight into what was a very successful station. The 45-minute walk from the Kanyaka waterhole to the station ruins is a reminder of how the unpredictable climate, can make what was a hard life into an impossible life through drought, flood and distance. 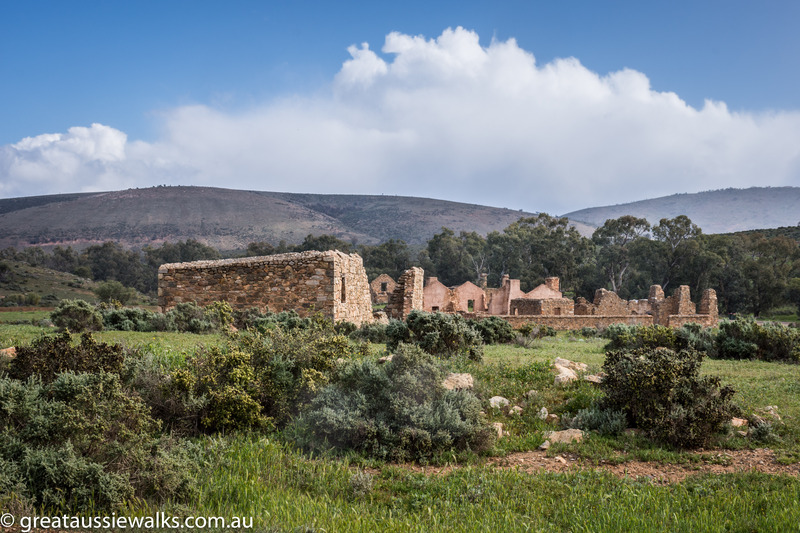 If you would prefer to walk less or have a stroller or wheelchair, you can park at the water hole and then drive to the ruins car park. If you are walking, make sure you have water and sun protection as shade on the unsealed trail can be intermittent. If you are travelling in the mid-north, take a detour off the Hawker-Quorn road to walk the path, which transcends thousands of years of history. You need to publish a book, Hazel, featuring all your stunning photographs - love the article too! I agree with Elaine, your articles and photos make me want to pack and hit the road. It would be a good book. Excellent article and photos.Have been here a few times ,but not when it so green.Have driven between the ruins and death rock.The walk would be better if one had the time and there were no flies around...they get really thick here in the heat.It is good that restoration work has saved these ruins.There was some muddy water by the rock when I was there...I imagine that there is now a large pool of clear water there now.